Located in the in the downstream of Mekong River, Ben Tre is one of the special agriculture provinces in the South of Vietnam. So what makes Ben Tre an attractive destination in Mekong Delta? That will definitely be its indigenous plant – coconut! Mentioning coconut candies, Vietnamese people will immediately think of Ben Tre. With the large number of coconuts, local people here started to create different kinds of specialties and coconut candy is one of the most favored. Keo Dua is mainly made of coconut milk, malt and sugar. To create tasty coconut candies, workers have to carefully choose the ingredients. Coconuts to make candy should be those newly dried inside and freshly picked from the trees so that the milk extracted will have the special flavor. Besides, malt is originated from high-quality sticky rice and cooked by highly-skilled craftsmen. In addition, sugar to make these candy has to be newly produced with a bright yellow color. Especially, coconut candies are wrapped with incredibly-thin layers of edible rice paper which also act as desiccants. Thanks to the careful production process and the truly delicious flavor, coconut candies from Ben Tre have been favored by not only Vietnamese but also foreigners. Coconut blade tastes so good but it is not an easy ingredient to find in the market. Coconut blade, considered as the “heart” of a coconut tree, is actually the youngest part inside the top of the tree. It is also known as the coconut shoot. Therefore, to get the coconut shoot, the whole tree need cutting down. 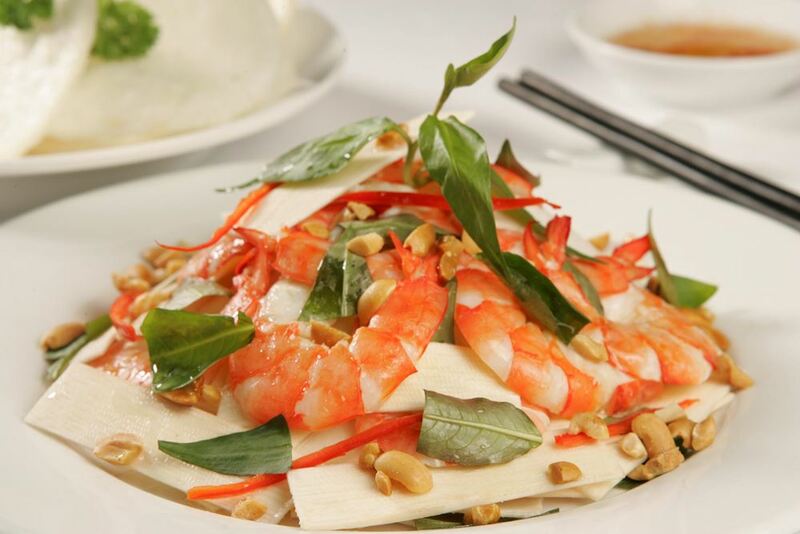 Coconut blade has the sweet and aromatic flavors, suitable to be mixed with fresh prawns and boiled bacon. The cuisine is usually added with slides of onion, corianders and peanuts. Sometimes, people like to enjoy the salad with shrimp chips. 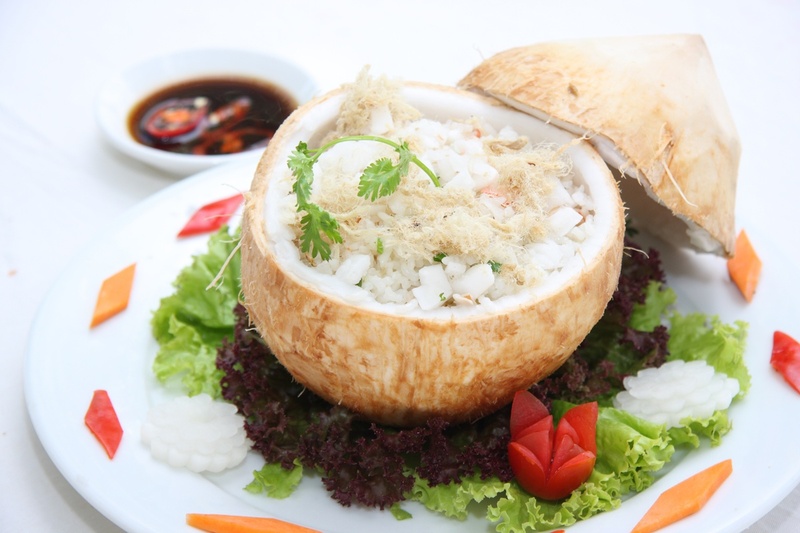 Since the coconut shoots are so rare, coconut blade salad becomes an increasingly tempting cuisine. Coconut worms are kinds of insects which make holes on the shoots of coconut or palm trees and lay eggs inside. These eggs then hatch into larvae and grow up by eating the coconut shoot. Larvae coconut worms are a real threat for plantations as they kill the entire trees. 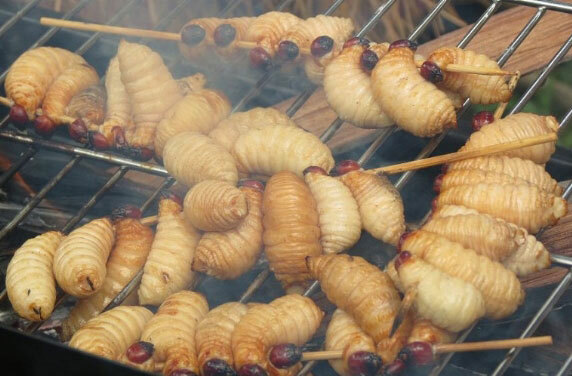 However, larvae coconut worms are also known as a fatty and delicious cuisine in Ben Tre. This coconut specialty can be made into different dishes such as rare worms, grilled worms, butter-fried worms, chili fish-sauce picked worms and etc.. These cooked worms have the delicious taste similar to egg yolk! Coconut is one the irreplaceable ingredients in every Vietnamese cuisine from main dishes to desert. Vietnamese people add coconut juice and milk to make dishes have the naturally sweet taste. Coconut wine is made from the traditional fermentation process, therefore, contains no chemicals and preservatives. Especially, the wine is not stored in luxury glassed bottles but right in complete coconuts, making it rustic but still elegant. 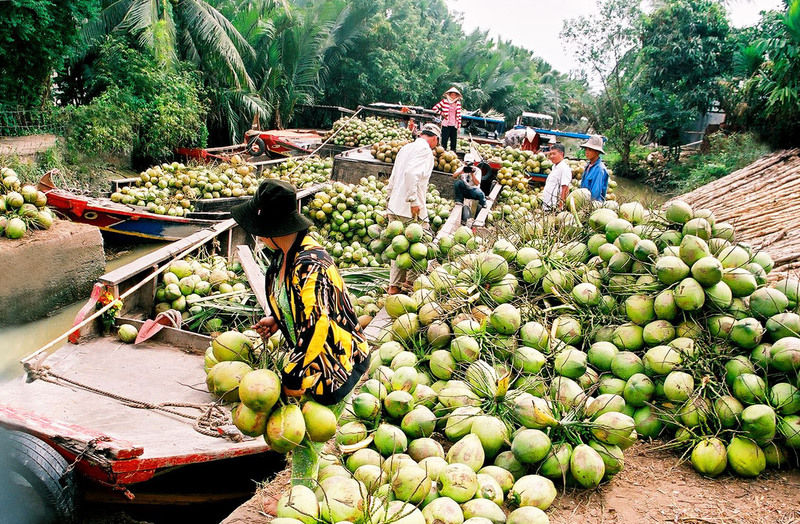 The specialty coconut wine of Ben Tre can surprise you with its useful functions. Drinking this coconut wine is believed to increase your appetite, benefit your digestion and make you physically fit. 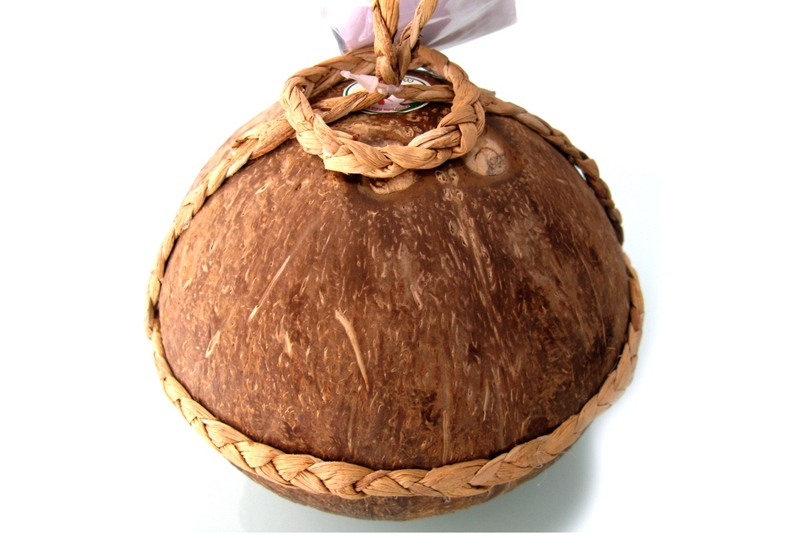 Eye-catching cover and delicious taste make coconut wine specialty of Ben Tre well known beyond the border of Vietnam. 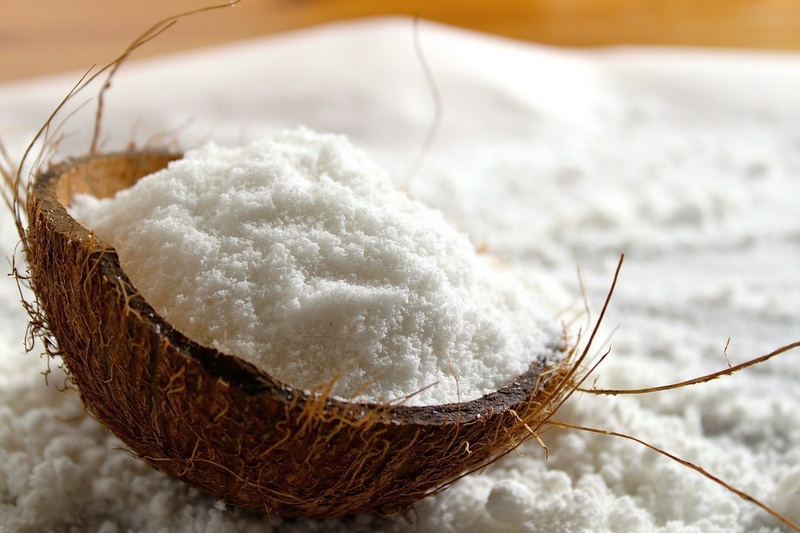 Are these five coconut specialties tempting to you? Surely if you are a fan of coconut or not, these coconut specialties would make you want to visit Ben Tre and try them all. So why don’t you plan a trip to this Mekong Delta province now?